Just because the guitar tuner app on your smartphone says your guitar is in tune doesn’t mean it’s going to sound its absolute best. There’s a few variables that can cause a guitar to not sound in tune when you’re playing chords or playing melodies, so if you really want it to sound good, you need to check a few other things after getting the individual strings in tune. If you’ve never tuned a guitar by ear, and you’re a complete beginner at music, this may seem like an impossible task. Don’t worry – it can definitely be learned. You’ll have an easier time with this if you have an acoustic steel string guitar. After you’ve tuned all the strings, check the intonation of the fifth string by playing the fifth fret of the sixth string and then playing the open fifth string, and make sure both strings are ringing at the same time. If they’re both in tune, you will feel a steady resonance in the body and neck of the guitar. If either string is out of tune, you’ll feel a vibration in the wood; the faster that vibration is, the more out of tune the strings are with each other. You’ll have to decide which one is out of tune by checking them with an electronic tuner, or by doing the same relative tuning check with the fifth and fourth strings. If those two are also out of tune, it’s likely that the fifth string needs to be adjusted; if they’re in tune with each other, the sixth string is the likely culprit. Repeat this process with the rest of the strings on the guitar until you get to the second string. To check that string, play the fourth fret of the third string and then compare that to the open second string. To tune the first string, compare it to the fifth fret of the second string. The lower pitched strings make more noticeable vibrations in the wood of the guitar neck and body than the higher pitched strings do, but the higher pitched strings make a more noticeable wavering sound that is easier to actually hear when they’re out of tune. 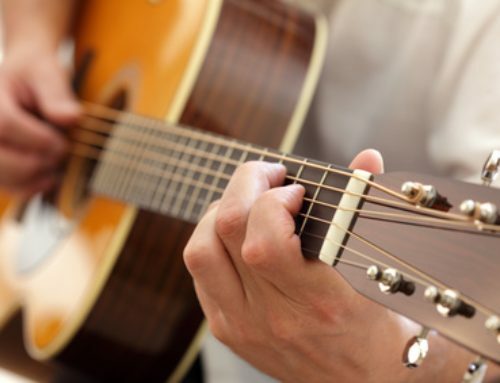 Whenever you tune your guitar with a tuner, you should also check the strings with the relative tuning method to develop your ability to tune by ear, and to develop your ear in general. The most common problem with tuning is that the second and first strings either a little sharp or a little flat on some chords. Often what happens after tuning a guitar for a student, I’ll find that the first and second strings sound a little sharp (i.e. out of tune) on the G and D chords, but sound okay on the A and E chords. In that case, I’ll deliberately lower those two strings a bit out of tune so the G, D, A, and E chords are all equally in tune. This can be caused by a few different imperfections with the instrument. Fret wear on the second and third frets under the first and second strings can cause the string to travel too far before hitting the fret and cause it to go sharp. Over time, little dents will form under the second fret of the third string, the thrid fret of the second string, and the second and/or third fret of the first string. This happens because those notes get played so much from the use of open chords like G, D, and A. Also, a neck that is a little out of adjustment and is bowed too much can have the same effect on how in tune the guitar is. This can also result in the strings traveling too far before hitting the fret wire, and result in notes that are a little sharp. This can be a big problem in the upper frets if the guitar neck is bowed a lot. Fortunately, this can easily be remedied by tightening the truss rod. The third and worst cause is that the nut slots weren’t cut correctly when the guitar was manufactured. If this is the case, and you have a really cheap instrument made by non-name brand company, you should consider getting a new instrument. If you have a brand name instrument by a company like Fender, Ibanez, or Epiphone, you might consider having a guitar repairman install a new nut. It’s not a difficult or expensive job to replace a nut on an acoustic guitar. It’s not you, it’s the instrument . . . If you’ve been trying to teach yourself how to play the guitar, and it’s not sounding as good as you had hoped, don’t immediately blame yourself. It could be that you have an instrument that isn’t in tune, or is in need of some maintenance so it can be tuned properly. Before you give up on playing, bring the instrument in to one of our teachers and ask them to take a look at it (or any guitar teacher for that matter). We’ll be happy to tune it for you, and if there are any issues with the guitar, we’ll tell you what they are and refer you to some of the repair shops we deal with.